Our Group strategy comprises a raft of far-reaching strategic decisions and specific initiatives aimed at safeguarding the long-term future and generating profitable growth. It is composed of four building blocks which cover strategic Group initiatives. We regularly review the progress of these initiatives so as to analyze the significance, suitability and target achievement of the measures defined. We are thus able to adjust the Group initiatives specifically according to the dynamic changes occurring within our Company. The first of these is the transformation of the core automotive business. Developing, building and selling vehicles will remain essential for the Volkswagen Group going forward. However, there will be far-reaching and lasting changes to this business in the future. That is the reason why we are comprehensively restructuring our core business to face this new era of mobility. 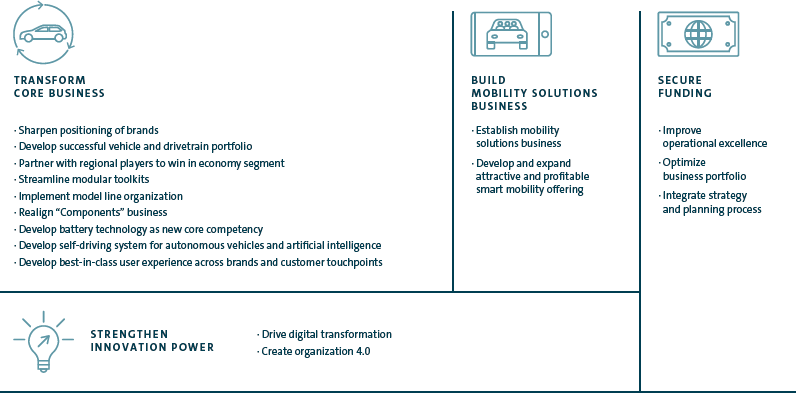 The second key building block in our Group strategy is establishing a new mobility solutions business. In this business, we are developing innovative and efficient, attractive yet profitable mobility services that are tailored to customer requirements with the goal of being one of the leading providers in this growth market in the future. With the third key building block, we are intensifying our traditionally excellent innovative strength and placing it on an even broader footing. This is necessary both for the transformation of our core business and for the establishment of the new mobility solutions business. To this end, we are pushing ahead with the digital transformation in all parts of the Company. Becoming one of the world’s leading providers of sustainable mobility calls for substantial capital expenditure. This will be financed in particular through efficiency gains along the entire value chain – from product development and procurement through to production and distribution as well as in the central supporting areas. Additional funds for future investments can also be generated by optimizing the existing portfolio of brands and equity investments. Through the fourth key building block of the Group strategy we will safeguard the financing of the Volkswagen Group and place it on a solid basis.